I am a third generation artist - born and educated in England, and I now live on the Eastside of Seattle. 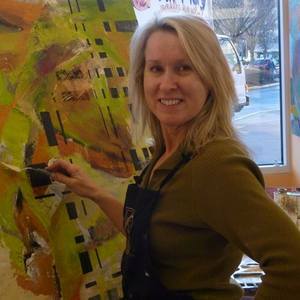 I am a lifelong artist, and from an early age I surrounded myself with art making. I gained qualifications in Civil Engineering, and have always returned to my true passion for the arts. I am a process driven artist. My work is generated in response to the materials that I use together with the techniques and processes that I have developed. I am interested in texture and surface, and I often embed multiple layers of pigment or found matter, such as fabrics, newspaper or sand into the under painting, to create a unique foundation on which to build. I court contrast and contradiction in my art. I continually challenge myself to explore new methods of working and thrive on attempting to harness the potential chaos of the unknown during the creative process of painting abstraction. I surrender to the rules of chance and natural intuition during the evolution of self-discovery through art making.